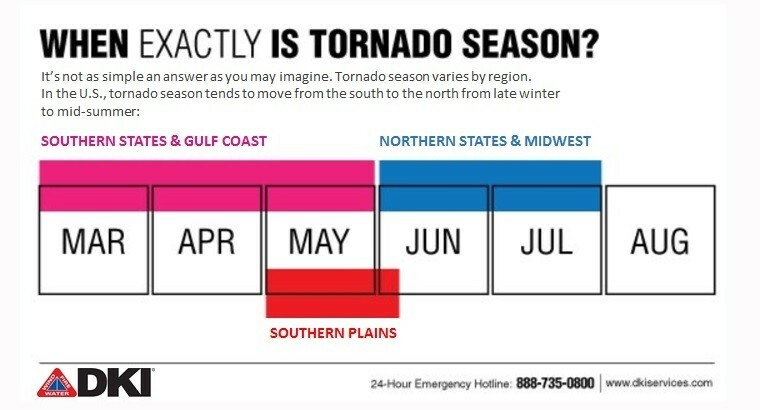 March generally begins tornado season, yet this varies by region, as shown in the graphic above, which also shows which states are most affected by tornadoes. Are you prepared? Tornadoes can strike quickly with little to no warning. Always be prepared before it’s too late. Form a communications plan with your employees. Listen to the radio and television newscasts for the latest weather reports and information. Tornadoes have been known to move in any direction. Tornadoes may vary from stationary speeds up to 70 mph (the average forward speed is 30 mph). Supercell thunderstorms are the best predictors of tornado activity. The difference between a tornado watch and warning.